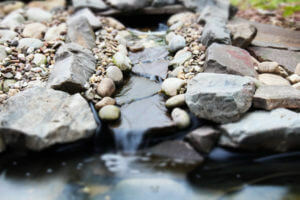 A small picturesque waterfall can add a fascinating dimension to a garden pond of any size. The tranquil sound of water splashing into a pond below will turn the most ordinary of gardens into a dream oasis – a place to relax and reflect. If you feel inspired to transform an area of your back garden into a water feature with water trickling over rocks into a pool below then here are a few tips to get you started. And, to help you budget for your project, I will share advice on measuring the amount of pond liner and protective underlay for your pond plus water fall extension. The first step to getting started is to decide where you are going to site your garden pond so that it offers maximum visibility from your house. The next important step is deciding what type of pond – to home Koi carp, to display a stunning array or aquatic plants or a pond built for the purpose of attracting wildlife? Koi need as big a surface area as possible and a pond depth of no less than 1.5 meters. A waterfall will aerate the water acting as a natural oxygenator – helps maintain healthy water and reduce algae growth while providing oxygen to both fish and aquatic plants. But, cascading water can also be hazardous to pond inhabitants so keep this in mind when planning your build. The best advice given by pond experts and landscape professionals is to do thorough research before embarking on any pond project. This will allow for a confident execution of your pond build as well as save on time and budget. Success is built on the foundation of thorough research! Join pond forum groups to see photos of established ponds. They also provide a platform to bounce off any questions you may have. Dedicated pond liner suppliers are generally experts and will be able to advice you accordingly too. There are preformed ponds and waterfalls which can be bought from specialist suppliers. A less expensive option which is what we prefer is the use of an underlay and flexible rubber pond liner. The reason – allows design flexibility and looks more natural. How to calculate pond liner dimensions? Add to your calculation an amount needed for the pond liner overlap (0.15m) – this is so you can secure your pond liner in place using your chosen edging material. How much of an overlay or overlap to add into your calculation really depends on how you plan to fix your pond liner in place. So, increase or decrease the amount of overlay depending on installation and edging method. For a more detailed discussion on determining pond liner measurements, please refer to a previous blog article, How much pond liner do I need? Do the same for the proposed area over which water will flow into your pond as a length and width measurement with sufficient width to secure the liner in place using rocks and slabs. In your pre-planning phase and to get a good feel for what your finished product will look like, you can use boxes of different shapes and sizes balanced on top of each other and side by side – just an idea and also helpful when measuring-up ahead of placing your order. Landscape the area around your pond and along the waterfall. The final step is the addition of aquatic plants and fish. Then sit back and enjoy the sheer tranquility you have bought to your home and garden – the 4th room will be paradise! This entry was posted on August 23, 2017, in Garden ponds. Bookmark the permalink. and all subjects related to garden ponds. *LinersOnline provide PayPal as your payment option. With PayPal, you can pay for your order with your credit card. You do not need a PayPal account in order to make payment.